When Janie Hendrix and The Friends of Jimi Hendrix Park began developing plans for the project at 2400 S. Massachusetts St., there was a lot of debate about whether or not the iconic statue on the corner Broadway Ave. should be relocated. The debate is over. Jimi isn’t leaving Broadway. Hendrix said she discussed the issue at length with Michael Malone, the owner of the statue and the building on the corner of Broadway and Pine that had been home to Everyday Music and will soon be home to Blick Art Supplies. 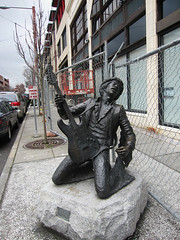 “We’ve realized that Capitol Hill doesn’t want to lose the statue,” said Hendrix. Hendrix, CEO and president of Experience Hendrix LLC, is currently on tour with a 19-city tribute concert series. If the news gives you the urge to kiss the sky, there’s actually a new Jimi Hendrix album available. Valleys of Neptune is a collection of recordings from 1969, a little over a year before his death and after the release of Electric Ladyland. Sony Legacy Records and Experience Hendrix LLC are planning to release other memorabilia this year, the 40th anniversary of Jimi’s death. There will be a new DVD documentary, a Hendrix-themed iPod and “Rock Band” video game, plus a re-release of all his major albums. Could be something to add to your collection when Everyday Music opens in its new location next to Elliott Bay Book Co. in April. From the CHS comments, thanks to Cory for pointing out that Jimi has a new neighbor. Welcome, Chuck! Hendrix hopes to have a statue commissioned and installed for the park’s grand opening, tentatively slated for 2012, the year Jimi would have turned 70. Before the Hill was hipsterville (three or four years ago for those with shorter memories), the removal of a decades-old landmark of what is arguably Seattle’s most prominent musical icon wouldn’t have even been up for debate. This is not Magnolia or Queen Anne. Those are the places if you want a subdued neighborhood. Jimi stays. What were they planning on replacing the statue with anyway? A Chihuly piece? On the other side of that building on Nagle Pl, a similar style statue was placed a couple weeks ago. It’s next to the Broadway Building’s residential entrance across from the tennis courts. I don’t know who it is and there’s no plaque to go with it yet. Does anybody recognize him? Capitol Hill was still definitely Hipsterville 3-4 years ago. As sad as it is, and as desperately as some people try to think that Capitol Hill was “different” just a few years back, it really wasn’t. Well, there are a few more ugly condos now. Looks like Chuck Berry, duck walk and all. A significant portion of Capitol Hill isn’t much different than Queen Anne. They had this hidden in the office of the broadway building when I went in to look at apartments a little over a month ago. 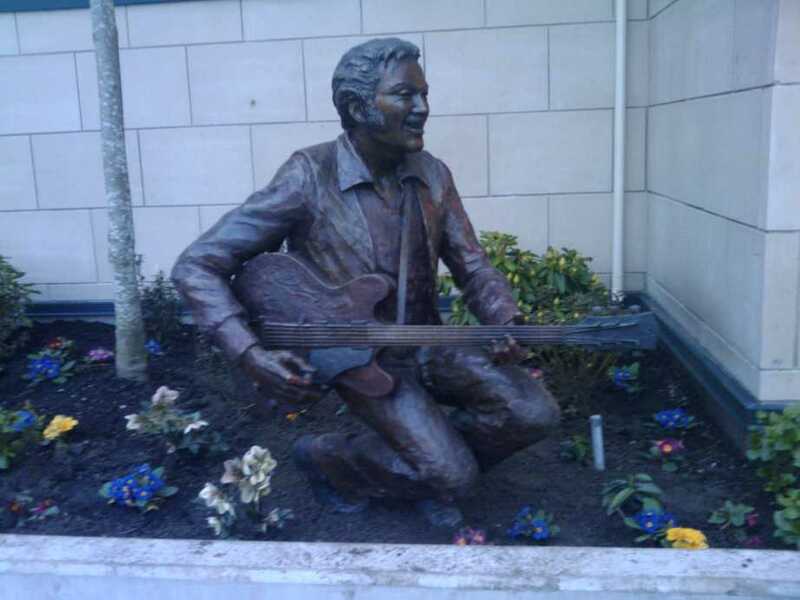 They also told me that the Jimi statue was goin to be moving around to the back (where the Chuck Berry statue is) or even into the lobby of the BB. Guess that didn’t happen.